Once again apologies for light posting. Other preoccupations, including dental appointments have been eating into time. Matters will improve. Well they can scarcely get worse. In the meantime there is only about 30 minutes left to remember the birthday in 1866 of one of the most delightful children's writers, Beatrix Potter. There can be no question but that what she wrote was masterful conservative tracts encased in easily understood stories with enchanting illustrations. Anyone who thinks otherwise should compare the lives of Benjamin Bunny and Peter Rabbit or find out what nearly happened to silly Jemima Puddleduck who was saved in time by the wise and traditionally minded dog, Shep. Tory Historian was once wandering round the National Portrait Gallery - the theme of tomorrow's blog - on a quiet day when the keeper of the Early Twentieth Century Gallery was predisposed to chat. He was eloquent in his admiration for Beatrix Potter and compared her very favourably with all the swaggering First World War generals and officers. The website says rather blandly: "The shortage is blamed upon a poor harvest and drought." Hmm. Not on the socialist government that was in charge of the country? "It was the best of times it was the worst of times"
This is not an anniversary any conservative can relish but neither can any historian ignore the beignning of the French Revolution, an event that changed the history of Western Europe and, in its wake, probably most of the world, whether for better of worse, we can argue about. were all going the other way. 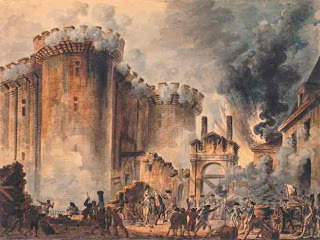 And, of course, one cannot do without yet another completely anachronistic and inaccurate picture of the storming of the Bastille. Tory Historian has something of an interest in popular and children's literature of the past and never ceases to marvel at the high quality of writing. Take Sexton Blake, the Sherlock Holmes for the masses (though, let's face it, Holmes was very popular, as well). As this website rightly says, Blake was a publishing phenomenon for most of the twentieth century. He was quite clearly a more exciting imitation of Sherlock Holmes, what with living in Baker Street and having a housekeeper called Mrs Bardell (a touch of Dickens there) and that assistant, Tinker, who starts off as a young lad but grows up and drives cars and flies aeroplanes. The adventures are truly bad - Blake is always described as being incredibly brilliant, much ahead of anyone in the world in his ability to think and understand but invariably finds themselves in messy situations almost anyone could have foreseen. But the escapes are always exciting. One can quite see why the short stories and books are so popular. Tory Historian has just acquired a 1960 edition of a 1920 story, complete with typical 1960s cover of a really bad and irrelevant photograph. What was it about paperback publishers of those years that made them go for that rubbish by way of cover illustration? Blake nodded and continued his examination. The discovery of the ecutcheon and the coat of arms had stimulated his interest:ut rather suggested that the unknown person who had once owned this flask was connected with some honoured and titled family. The flask itself was too exquisitely designed and the engraving too costly for it to have been bought at an ordinary shop; it had no doubt been specially designed bor the person whose initials it bore: or he may have received it as a present. Let us not forget that very many, if not the majority of the readers of Sexton Blake's adventures were children and teenagers or as they were referred to disdainfully by the snobbier literary elements, office boys. Colin Jones in his book, “Paris – Biography of a City”, already mentioned once by Tory Historian, describes an interesting example of a misunderstanding arising from best intentions. So his first defeat in 1814 caused distress only because for the first time since the seventeenth century Paris was invaded by foreigners. Otherwise, Parisians were not all that bothered by l’Empereur’s exile. Here is where a certain misunderstanding arose, as Professor Jones describes. When the allied troops had entered Paris for the first time in 1814, many of them wore a white cockade to signify their peaceful intentions towards Parisians. Thinking that they would show the invaders their appreciation for this gesture, many Parisians wore the white cockade in return. However, Bourbon sympathizers among the troops imagined that by wearing these cockades, the Parisians were showing their undying support for the Bourbon cause (white being the monarchy’s ceremonial colour). This misunderstanding led the allies to imagine that Paris was massively pro-Bourbon and pro-Restoration. The years after 1815 would show how wrong this was. Indeed the regimes which followed Napoleon produced a nostalgia for his rule which his rule had done relatively little to justify. In the first place, Parisians were not all that bothered by the Bourbons’ escape upon hearing Napoleon’s return from Elbe, as Louis XVIII and his family had not exactly endeared themselves to the people of the city. However, Napoleon proceeded to antagonize them by not having the time or inclination – he was fighting for his survival, after all – to solve the economic crisis and by showing his distrust of the people in refusing to arm them. Anyone who had lived through the revolutionary years would have been wary of the nightmare of another possible sans-culotte anarchy. As to the unjustified nostalgia, it is certainly there in the colossal structure of the Invalides, in the preposterous Vendôme Column and in the obsession so many French politicians still have with le petit caporal. ... a book that looks extremely interesting: "Between the Thin Blue Lines", edited by Jean M. Lucas. It is a story of the rise, powerful presence and gradual decline of the Conservative Party Agents. Not only do I intend to read it immediately but I shall be looking for someone to review it for the Conservative History Journal. In the meantime, the book is published by Trafford Publishing, a Canadian firm, and is available in Britain from Miss Lucas herself (jeanlucas_AT_uwclub.net). Was John Buchan an anti-semite? This question has been exercising various people's minds ever since it has been decreed by the literary powers that be that Buchan is rather an inferior writer. There is no explanation why people still enjoy reading him and why his books keep being reprinted but that sort of thing does not bother the powers that be. The point is that Gertrude Himmelfarb has written a fascinating essay on John Buchan. Published in "Victorian Minds" in 1968 as "John Buchan - the Last Victorian", it was reprinted in 2006 in "The Moral Imagination" as "John Buchan: an Untimely Appreciation". It is an interesting and well-argued essay even if Tory Historian does not agree with everything in it. Naturally enough, the question of anti-semitism comes up (just after the question of racism, a slightly more complex issue) and, on the whole, Professor Himmelfarb finds that though there is a certain amount of passive anti-semitism in the novels, as was common in those halcyon pre-Nazi days, Jews are not necessarily the villains and, anyway, there are various extenuating circumstances. There were, in fact, Jewish rag dealers and pawnbrokers, Jewish Communists and financiers in England at the time, an England that was far more ethnically homogenous than it is now. There were, as it happens, Jewish other things as well and there is no particular reason why Buchan should not put them into his novels or, occasionally make Jews into villains or describe people who dislike Jews. His novels are considerably less anti-semitic than those of the much-praised Dorothy L. Sayers. Besides, as Professor Himmelfarb points out, Buchan publicly denounced Hitler's anti-semitism as early as 1934, publicly espoused Zionism and spoke of the "racial similarities of Scotsmen and Jews, with particular reference to their high regard for learning". No higher praise could have come from a man like Buchan. The occasion on which he made those last comments was a ceremony on which his name was inscribed in the Golden Book of the Jewish National Fund. According to Professor Himmelfarb, "it is tempting to remark upon the irony of the fact" that this should have happened to "the fictional perpetrator of Jewish-capitalist-communist conspiracies". Tory Historian was a little puzzled. Just which novel had those conspiracies? Not "Huntingtower" where the evil Bolshevik leader is a former tsarist officer. Not the books of the Great War where the villains are, obviously, Germans. Not in any of the Edward Leithen novels. Where then? Yet it is disconcerting to find that the plot of one of his most successful novels, Thirty-Nine Steps (1915), centers [sic] upon an international conspiracy devised by Jewish anarchists and Jewish financiers led by a "little white-faced Jew in a bath-chair with an eye like a rattlesnake" who is avenging himslef for centuries of persecution. That quotation from the first chapter is part of the rant delivered by the mysterious agent Scudder, who is promptly murdered in Hannay's flat, encouraging the latter to escape to Scotland. When Hannay eventually deciphers Scudder's notebook, he finds that most of what he had been told that first evening was bosh and subsequently, Sir Walter Bullivant, who appears to be head of whatever secret service there is around, explains that Scudder was a good agent but a little peculiar in his ways. In particular, he had a Jew fixation, something that Bullivant dismisses, while acknowledging that the man got his facts right. The plot, as it happens revolves round a German spy-ring, eventually arrested with Hannay's help, though, as we find out in "Mr Standfast", the worst of the gang escapes to create many problems in that novel. No, he is not a Jew, either. His name is Graf von Schwabing and he is a real bad hat. All of which goes to show that even renowned professors should check their facts before writing essays. Not one, not two but three books on the go. One was lent Tory Historian by a friend in Paris, whence the book bag came back with more volumes in it than it had departed with. It is a collection of essays by Christopher Hitchens, erstwhile left-wing and now rather right-wing though not precisely conservative scourge of all and sundry. Entitled "Love, Poverty and War", it is well worth reading for the evisceration of Michael Moore if nothing else. But, as it happens there are numerous fascinating pieces, not least on Winston Churchill, Rudyard Kipling, Aldous Huxley, Evelyn Waugh, David Irving and Mel Gibson. Sometimes Hitchens goes strangely astray in making serious errors of omission and commission. But mostly it is pure unadulterated intellectual joy. Not for those with weak nerves. For serious reading there is Mitzi Auchterlonie's "Conservative Suffragists", a seriously underrated subject so far. In general, not enough has been written about women in the Conservative Party and on that side of the political divide, though in many ways they achieved more than their much-trumpeted colleagues on the left. This book should balance matters out somewhat. There will be another posting about it. Finally, a book acquired today: "The Letters of Julian Maclaren-Ross", launched, very appropriately, in the upstairs bar of the Wheasheaf pub in North Soho (and no, there is no such place as NoHo in London). The whole event was organized by the excellent Sohemian Society, one that all conservatives, liberal conservatives and, dare one say it, libertarians should pay attention to. Fans of Anthony Powell will recall that Julian Maclaren-Ross, who appears a good deal in Powell's memoirs, was also the inspiration for X. Trapnel in the last trilogy of the "Dance to the Music of Time".